The huge tsunami which covered 80%up the above of the North American Continent. （英）The huge tsunami invades the Great Basin and makes Mesa and Butte. （韓）그 거대 해일은 그레이트베이슨에 침입해 Mesa나 Butte을 만들고 있다. （ｽﾍﾟ）El tsunami grande invade la Gran Cubeta y hace Colina y Butte. （伊）Il tsunami enorme invade il Grande Bacino e fa Mesa e Monte isolato. ① I join that the huge tsunami which went north in the east Pacific went north in a west coast of Central America and rush at the Gulf of California entrance. ② I scrape off the door, and the tsunami which rushed makes depth. 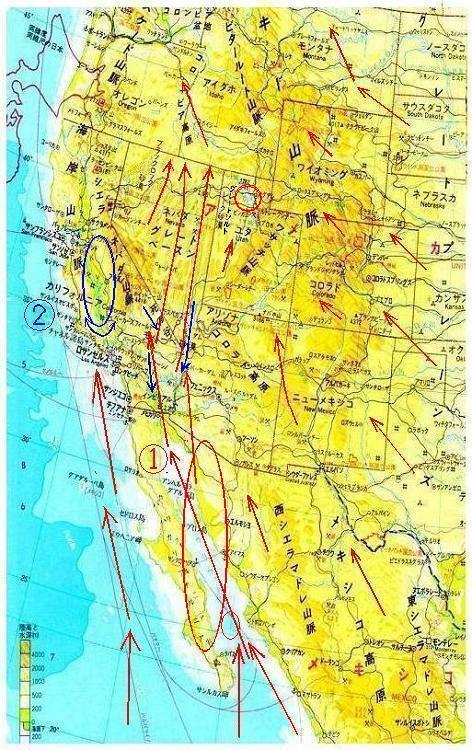 ③ The huge tsunami collected by Gulf of slim California becomes the jet current and invades the Great Basin. ④ The first wave of the huge tsunami carries the shellfish which had habitation in the Gulf of California in the Great Basin. ⑤ Two three four and wave height become low, but add to power more successively because they include a rock in the current. ⑥ And the mark left on a bullet was gradually deepened and prepared mesa and Butte of slim form into the north and south. As a result. The shell has been left in the top of mesa and Butte. ※The top does not have the stratum than 65 million years in front. Yes, I can prove this thing by an experiment if you lend the hose. Take a whump in the first wave of the tsunami; and the trace is one, two, three with a hose. Nobody understands such a simple experiment. ^^? The seawater carried in Utah becomes the great salt lake. The dinosaur Museum of Utah is famous. The strong flow of the tsunami tended to take the float to the flank. An interesting thing may appear if you look for north area of the Blacklock Desert who is western than this. ⑦ The enormous seawater which got into the plate-shaped Great Basin has the overflow water to the Columbia and the great Horne area, but begin a countercurrent to the direction where the cause came to. ⑧ When I already went ashore, the route is carved with. Because I run the slope with a rock, and time dating back than time when the tsunami climbs the mountain goes down, the power is great. ⑨ As a result. A mark left on a bullet is deepened more and more in the lower part of a river. The reason why Death Valley is under current sea level is that a side style of the tsunami is added to this. The huge rock which flowed out should roll to the down stream of Death Valley then. ⑩ In the Colorado gorge, the course of the dilatational wave accorded with the line of the tsunami to the north and south, and it became a stronger flow. There is the request from the amateur who is weak in arithmetic. Because I was too small, and it could not enter when the mud flood which a tsunami carried was going to enter the small chasm, I piled up sullage on Santa Barbara of the entrance. As a result. The fish carried with seawater lose an exit and become oil there. The huge tsunami collected the fish which had habitation in the Pacific to Alaska. Would the United States want to assume it a way station to the Europe? I cast a big sum from former Russia and bought Alaska. There was the criticism with the ridiculous shopping, too, but the gold ore was discovered afterwards in those days. And 25% of U.S. oil is drawn now in Alaska. I do not know what becomes happy. Furthermore, where would the animals and plants of enormous quantity collected to the Arctic Ocean go to?